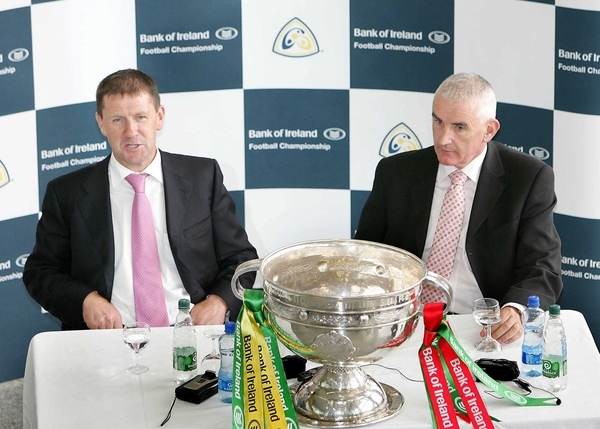 Watch The Sunday Game Live featuring the All-Ireland SFC final on RTÉ TWO from 12.30pm to 5.30pm. Listen live on RTÉ Radio 1. 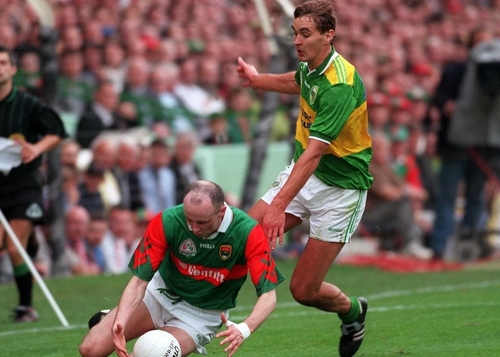 Ahead of Sunday's All-Ireland Football final, RTÉ Publishing's Barry J Whyte continues his look back at some memorable encounters between Kerry and Mayo. Mike Frank Russell once called him 'the Mick O’Connell of our era'. It's a compliment Maurice Fitzgerald – the subject of the praise – would have been happy to get, for he modelled his game on O'Connell's. But he'd probably never tell you he was happy. There are two kinds of Kerrymen, verbose and engaging, or taciturn and reserved. Fitzgerald, like his hero, is the latter. While Pat Spillane could kick and talk simultaneously (and probably did, in fact), for the likes of O'Connell and Fitzgerald, kicking was talking. For them, articulacy came from the boot, not the mouth. The 1997 All-Ireland final, then, is Fitzgerald's great oration. Though time has not yet worn out his sideline ball against Dublin in 2001, the All-Ireland final of 1997 is a far stronger contender for title of Greatest Maurice Fitzgerald Moment. Rather than one minute of greatness he produced seventy, and led his county to All-Ireland glory into the bargain. And more importantly, this game was absolutely crucial for both Kerry and Fitzgerald. For Kerry, it was a matter of history. It's easy to think of The Kingdom as perennial winners, but in 1997 it had been 11 years since they last lifted Sam. By contrast, in the 11 years before that, they'd won it eight times. It's a peculiar kind of Kerry drought, but it was causing more than a little disquiet in the county. For Fitzgerald, it was a matter of legacy. Everyone remembers great players, but they’re easier to forget if they haven't collected at least one Celtic cross in their time. Victory catapults great players into the pantheon of legends. Though the match itself was no classic, a diamond found in a bin is still a diamond. Even so, there's little point going through the match in forensic detail. Only Fitzgerald’s contribution mattered. However, that contribution was under some doubt on 22 minutes when Fitzgerald, having already committed to the swing, connected with team-mate Billy O'Shea and broke the latter's leg. It upset the Caherciveen man greatly (it probably wasn't the best moment for O'Shea either) but he didn’t let it upset his game. He overcame the sickening feeling of sending his team-mate and friend off the Croke Park pitch in agony on the last Sunday of September and turned himself towards the task of leading Kerry towards a victory it sorely needed. If you need a single moment that summed up his performance, consider the final moment of the match. Like the sideline kick in the 2001 quarter-final against Dublin that received so much attention and adulation, he stood on the sideline, about 45 yards out, and swung the ball over the bar. In an era in which footballers seem incapable of the most basic of footpasses let alone ambitious, pressure-laden points, it was an expression of a sublime gift. The 2001 kick drew Kerry level with the Dubs. The 1997 kick capped a complete display of football – perhaps the complete display of football – and landed the Sam Maguire for this Kerry team. Moreover, it was just one of at least three free-kicks that left the crowd breathless. This was Fitzgerald in his pomp. Still, debates over which kick was the best are entirely misleading. This game was not about the final score or any of the scorers. Indeed, Fitzgerald’s tally at the end hardly does the match justice; 0-09 points in a 0-13 to 1-07 victory is impressive but doesn’t exactly make the eyes water with disbelief. What made his performance great was not the mere accumulation of scores. This game was about quality, not quantity. What mattered was the manner of his performance, his languid grace and effortless kicking, which all seemed to hark back to a different time. In a team comprising Kerrymen who had not yet won an All-Ireland – surely a first since the first Kerry All-Ireland – this was not just an important Kerry victory, but an important victory for Kerry football. Tomorrow's instalment is the 2004 All-Ireland football final.